Gregory Djanikian is retiring at the end of this academic year from full-time work at Penn after many, many successful years as director of the Creative Writing program. Everyone who has worked with Greg will miss his generosity, patience, administrative ingenuity, his fine stewardship of the program, and his consistently superb teaching in poetry workshops. We won't have to miss him too terribly much, however, as he will be back each spring semester to teach a class. Greg's eminence as a writer is amply indicated at his Poetry Foundation profile page — and you can hear recordings of him performing his poems on his PennSound author page . When you next see Greg, please give him your very best wishes as he turns greater attention toward his next books of poems, travel, and family (including a granddaughter). I'm thrilled to announce that Greg's successor will be Julia Bloch. Julia is the author of Letters to Kelly Clarkson (a finalist for the Lambda Literary Award) and Valley Fever, and is the recipient of the Joseph Henry Jackson Literary Award and the William Carlos Williams Prize for poetry. Along with poetry in numerous journals and anthologies, she has published articles and reviews in Journal of Modern Literature, Tripwire, The Volta, and elsewhere. 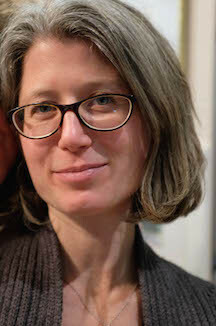 She spent several years as an editor in the Bay Area before earning an MFA in poetry at Mills College and a PhD in English here at the University of Pennsylvania, and for several years taught literature at the Bard College Master of Arts in Teaching program. Since 2011, she has worked as coeditor of Jacket2, and since 2013 has served as Associate Director of the Kelly Writers House. If you are unfamiliar with Julia's writing, I urge you to have a listen to recordings here.